Cosemi has announced its first OptoDP active optical cable that supports a DisplayPort 1.4 connection. That in itself isn't newsworthy, but up to 328 feet, or 100 meters, it seems rather interesting. The cable supports resolutions up to 8K60 4:4:4 at 60 Hz and is designed for users who need to connect ultra-high-definition displays/TVs or projectors to sources located far away. Compared to DP 1.3, which supports up to 4Kp120 and 8Kp30, DP 1.4 can enable Display Stream Compression 1.2 and Forward Error Correction, despite no difference in bandwidth between the two standards. This allows DP 1.4 hardware to support 7680×4320 resolution with 4:4:4 chroma subsampling at 60 Hz with 10-bit color and HDR (as well as 4Kp240) over a ~25.92 Gbps interconnection. Cosemi’s OptoDP active optical cable guarantees DP 1.4 signal integrity at the length of up to 100 meters without any additional external power. Cosemi demonstrated the work of its cable with 8Kp60 resolution at the Optical Fiber Communication Conference and Exhibition (OFC), with the National Institute of Information and Communications Technology (NICT) and TechnoAP. Keep in mind that the showcase was focused on demonstration of signal integrity and not on an actual 8Kp60 display with appropriate content. Technically speaking, there are DisplayPort 1.3-compliant active optical cables supporting up to a ~26 Gbps bandwidth. 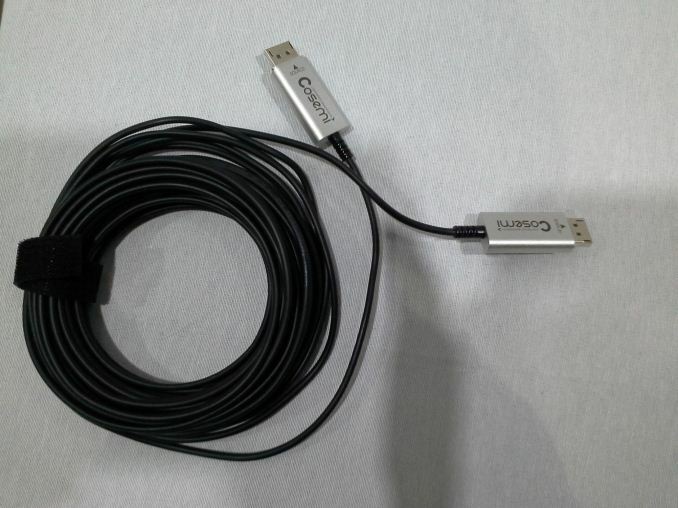 However, Cosemi’s cable is extremely long and the company has demonstrated that it works. Before coming to a commercial product, the cable will actually get an official DP 1.4 certification. 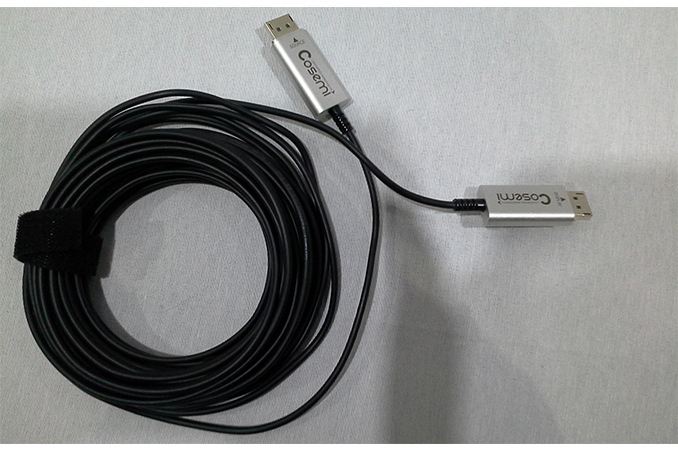 Cosemi said that it would start production of OptoDP active optical cables shortly. In addition, the company is prepping an active optical USB Type-C cable that would enable DisplayPort 1.4 over USB-C interconnections at long distances. The manufacturer said nothing about pricing of its cables, but given that we are talking about a 100-meter active optical solution for prosumers as well as cinemas, they will everything but cheap. For example, a 30-meter active optical DP 1.3-compliant cable retails for $799.99.